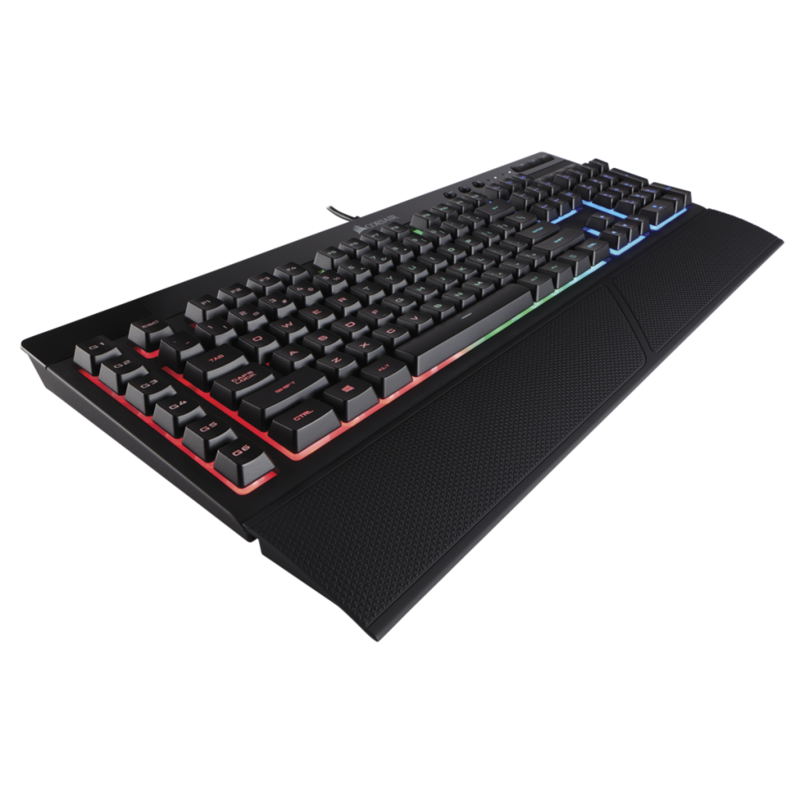 The K55 is a cheap gaming keyboard that tries to look like a mechanical keyboard, with big separate keycaps, but with simple rubber dome switches underneath. I.e., it should be a lot quieter than a mechanical keyboard – but also potentially a lot worse in tactility and feeling. The resulting lighting is still very pleasant, and when doing animations like color waves, the net result is actually very hard to tell apart from the per-key animation of the K65 keyboards! The lights come through in a very nice way, and I must say it looks better than the Corsair RGB Silent Strafe I tried before. The solid black color of the keyboard and the keys and the palmrest works really well together with the lighting. 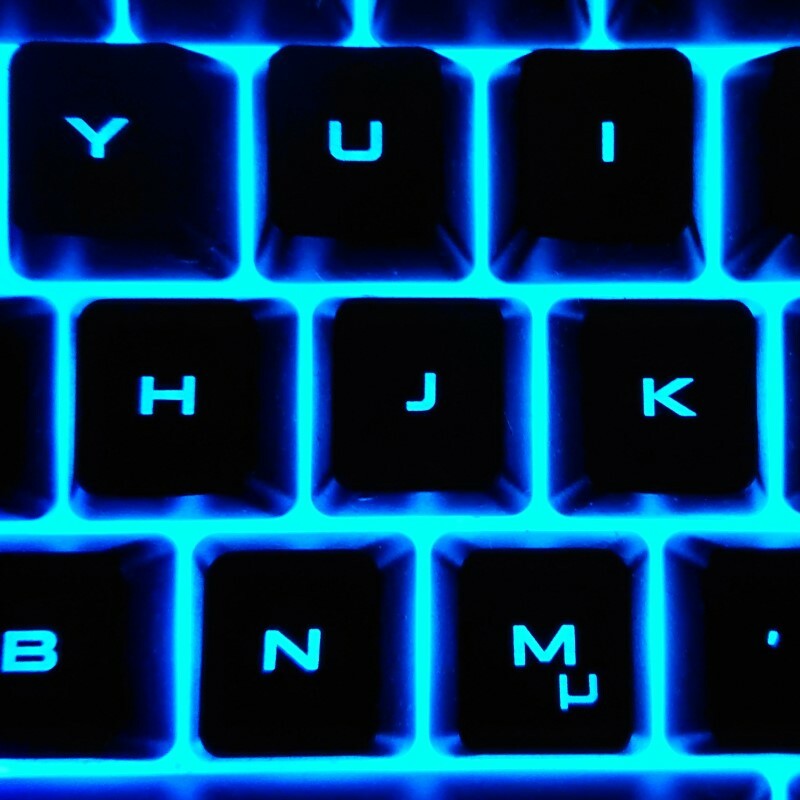 My K55 keyboard, with lighting settings as above – you can clearly see the bleed between the color zones, which helps hide the fact that there are only three zones on the keyboard. The keys are surprisingly good – putting a big fat keycap on top of a membrane/rubber dome keyboard base works well. 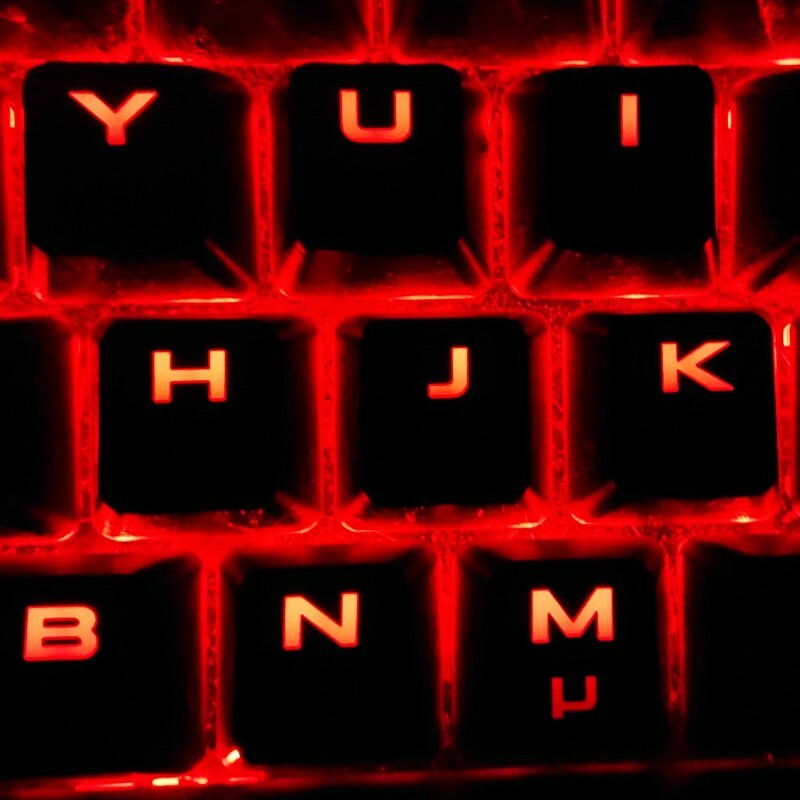 The printing on keycaps is a bit odd, for some reason the keys are printed with the letter in the middle rather than in an upper corner as on my other Corsair keyboards. The quality of the plastic feels different from the K65 and K70 keyboards, it is cheaper and feels cheaper too in some way. But not so much that it hurts. It is also not possible to pull the keycaps to clean the keyboard, and the keyboard comes without the “gaming” keycap sets that are common on the higher-end Corsair keyboards that I have bought. The K55 actually has better media controls than the RGB Strafe Silent. The K70 wins with its nice roller for volume, but the K55 is far better than the K65. Thanks to being full-size, there is room for a mute button in addition to volume, as well as a set of playback control keys. While I do not find the playback controls of much use for me personally, I love having a fast mute function for my computers. Normally, sounds is off on all machines I use, since computers should not normally make noises except when asked. This keyboard is noticeably quieter than the mechanical keyboards. The ‘nasty clicks’ that are very audible in conference calls while taking notes or typing is a lot less noticeable compared in particular to Blue Cherry MX switches. You do not get people asking you to mute when on the Corsair K55, and you do not need to try to type silently. To be fair, the same was true for the RGB Silent Strafe. Thus, it definitely solves the “noise” problem sufficiently well. The feeling of the keys is not as nice as the other Corsair keyboards I have used. It is a lot “mushier” than a real mechanical keyboard, but not so much that it becomes a problem. The proper full-size keycaps makes up for it a lot, and the key travel is still nice. Compared to typing on a laptop keyboard, it is a far superior experience (even compared to a good one like my trusty old Sony Vaio or the Thinkpad I use for work). Basically, right now, this is the best family- and coworker-friendly solution I have found. I think the K55 is going to have a long career as my work-at-home main keyboard.